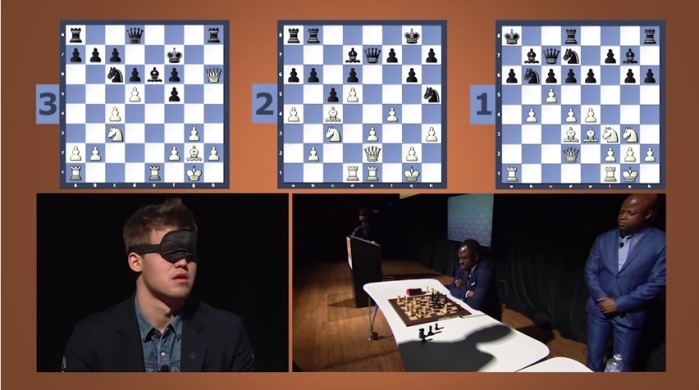 World Champion Magnus Carlsen played a blindfold simul in New York earlier this month and we now have video of the full display. 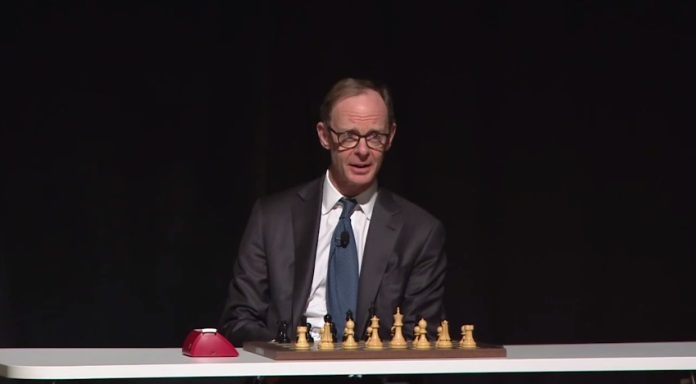 The event was hosted by Maurice Ashley and featured “only” three games, but with the twist that Carlsen's opponents could move at any time they chose and all the games were played with a clock. 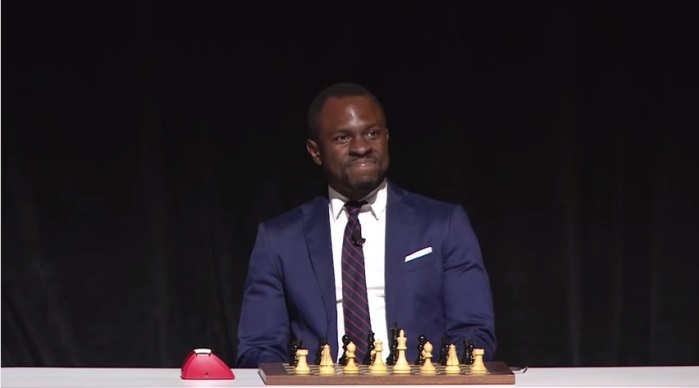 The Wire star Gbenga Akinnagbe (Chris Partlow) was among Magnus' challengers. Carlsen also recently met with mathematician John Nash, who sadly died today in a car crash. The blindfold display took place in the Avery Fisher Hall in the Lincoln Center, New York, as part of the 20th Sohn Investment Conference. That event brought together some of the world’s leading investors while also raising over $4 million to combat childhood cancer. "I think I spent longer studying his games than he spent studying mine..."
I asked Garry Kasparov for his advice… and there followed a minute of silence! I met Magnus when he was 13 in 2004. He was playing for the World Championship in Tripoli, Libya, and I tried too hard to play chess with Gaddafi and was thrown into jail. So this can’t be worse! I can find Sochi on a map! That’s pretty much it. Yes, it really makes all the difference. Without the clock and people playing in turn I can do a lot more than three boards, but it was really stressful with a limited amount of time. Fortunately for me at some point I started to get some advantage in the games and Paul was doing really well but his time was running out, so he had to spend too much time to find those good moves. Did you train for this at all? No, not playing with the clock. I’ve played a few blindfold simuls before but with the clock that’s a different matter entirely. Did you feel clarity? It seemed like you had total control over what was going on in your head. Explain to a lay audience what it’s like to play such a match? The thing is that you only need to keep one game in your head at a time. It’s a little bit difficult to play when I’ve no idea what my time is – if I’m running out of time. It’s manageable for a good chess player to play blindfold, but the time control does not allow me any time to think or ponder on my moves. That’s the difficult part. Are you ready to take on six challengers next time? Well, I’ll need more than 9 minutes then, because time got a little short, but it’s really very interesting to play blindfold chess. I hope you enjoyed it. 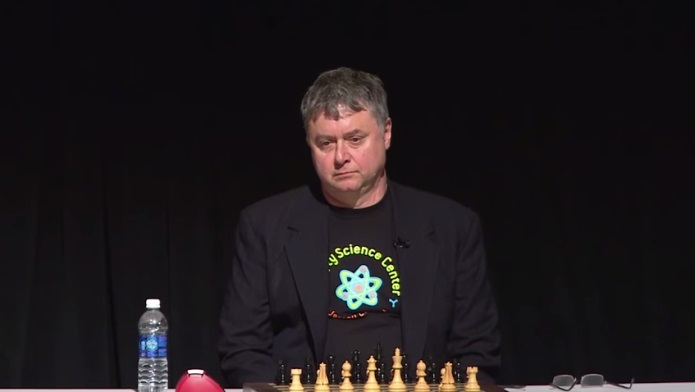 Sadly another Carlsen encounter had a tragic follow-up. 86-year-old John F. Nash, famously portrayed by Russell Crowe in the film A Beautiful Mind, requested to meet Magnus Carlsen in Oslo last week when he was there to receive the 2015 Abel Prize from the Norwegian Academy of Sciences and Letters. Imagine, he’s only 24 years old and World Champion. He’s a star – a Justin Bieber. Just now, while we were preparing this article, the news broke that John Nash and his wife Alicia were killed in a taxi crash in New Jersey. RIP.